In what has been a process plagued with irregularities, secrecy, and doubts about transparency produced by the Cuban and Bahamian governments, the proceedings being held against the Royal Defense Force guards accused of abusing Cuban and other migrant detainees in the Carmichael Road Detention Center, have now been further tainted with what appears to be yet another abuse of power and disruption of Justice, in this instance, practiced by the Cuban government against witness Yordan Cantero and perhaps, suspiciously quietly tolerated as legitimate by some high ranking Bahamian authorities. As a human and civil rights advocacy entity, the Democracy Movement has been closely monitoring the process against the accused guards but have remained distant in the last several months to contribute to allow the process to unfold without any undue pressure. (Published today in the Tribune242.com) “As the trial got underway, Mr Munroe noted that there were several inconsistencies with Cantero’s account of the events that took place. The Democracy Movement and other people and entities interviewed witness Yordan Cantero months ago in regards to what took place at Carmichael Detention Center and he was very firm on denouncing the abuse by the accused guards. 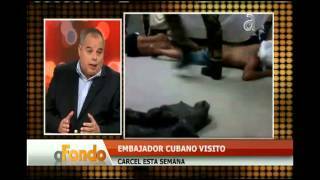 Despite being a key witness in the investigation, Yordan Cantero was quickly repatriated to Cuba without being properly interviewed by the investigating entities in The Bahamas. This happened after a suspicious meeting between Cuban officials and the Minister of Foreign Affairs of The Bahamas. Yordan Cantero was removed from his home in Cuba a few days ago by the State Police and kept isolated according to published reports in the press (please see martinoticias.com). In an interview with the press Yordan Cantero’s father, Jose Berta, stated that his son was removed from the home and that he (the father Jose Berta) was only able to communicate with his son when his son called him. Yordan Cantero arrived at the Bahamas on Sunday to testify closely accompanied by two Cuban State Police agents and was taken back to Cuba immediately after he testified in the proceeding being held in a military base without public or press access. Yordan Cantero’s original testimony is of public domain. His pictures showing the marks of the tortures are all over the Internet. We have his original testimony. 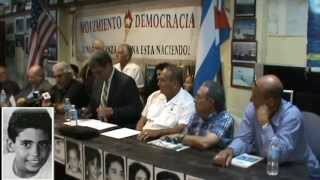 In a message released in its Facebook and web page www.democracia.org two days ago, the Democracy Movement alerted about the possibility that the Cuban Government would intimidate the witnesses based on some of the elements listed above. Unfortunately, it now appears that our fears have materialized and that the witness has been intimidated enough to contradict his own original testimony in order to affect the outcome of the proceedings followed against the accused guards. The proceedings have been adjourned in order to give time to locate another key witness, Alexander Vazquez, whose lung was perforated by the abuse committed against him by the accused guards. According to an interview with the Press (martinoticias.com) Mr. Vazquez is now living in the State Oregon in the United States and can be easily located. Mr. Vazquez’ testimony is crucial to the proceedings taking place and for Justice to be better served. Although we have tried to put behind this episode that divided our communities, we are profoundly disillusioned with the way in which transparency continues to be compromised by the present administration of The Bahamas and the assistance of the government of Cuba whose duty was to defend the human rights of its own citizens but chose to join the cover up attempted by some high ranking officials in the government of The Bahamas. We emphasize that we deeply respect the Bahamian People and are well aware that the unfortunate actions of a group of abusive guards in Carmichael Road Detention center do not represent the character of the rest of the people of The Bahmas or even the rest of the Royal Defence Force and other police entities in beautiful The Bahamas.